New Delhi: India on Saturday successfully test-fired the BrahMos missile with an extended range of 450 km, with officials calling it a "text book launch". The enhanced version of the supersonic cruise missile was test-fired from the Integrated Test Range off the Odisha coast at 11.30 a.m. on Saturday, a statement said. 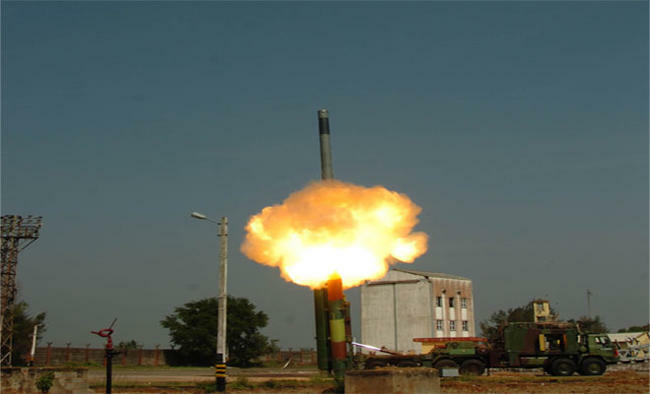 "In a historical first, the formidable missile system once again proved its mettle to precisely hit enemy targets at much higher range than the current range of 290 km, with supersonic speed of 2.8 Mach," said the statement from BrahMos Aerospace. During the launch, the land-attack version of the supersonic cruise missile system met its mission parameters fully, officials said. "It was a textbook launch achieving 100 per cent results, executed with high precision from the Mobile Autonomous Launcher (MAL) deployed in full configuration," the statement said. "With the successful test firing of BrahMos Extended Range missile - BrahMos-ER, the Indian Armed Forces will be empowered to knock down enemy targets far beyond 400 km. BrahMos has thus proved its prowess once again as the best supersonic cruise missile system in the world," BrahMos Aerospace CEO Sudhir Mishra said from the launch site. An announcement regarding extending the range of the cruise missile, a joint venture of Indias' DRDO and Russia's NPOM, was first made by DRDO chief S. Christopher on February 14. The range of the BrahMos missile, was 290 km - even as it was capable of going beyond it - due to India not being part of the Missile Technology Control Regime (MTCR), an informal and voluntary global partnership to prevent proliferation of missile and unmanned aerial vehicle technology capable of carrying over 500 kg payload for more than 300 km. India joined the MTCR in June 2016, making extension of the missile's range possible. Christopher had said that only a software change was required for this purpose. The Indian Army has already inducted three regiments of BrahMos in its arsenal. All are equipped with Block-III version of missile, which was recently tested on May 8 and 9. The fire-and-forget missile, which can be fired from all three media, has the capability to take on surface targets by flying a combined hi-lo trajectory, thus evading enemy air defence systems. Inclusion of the powerful weapon system in Indian Army has given it a distinct operational advantage to hit an enemy target even in the most difficult and hidden terrains.